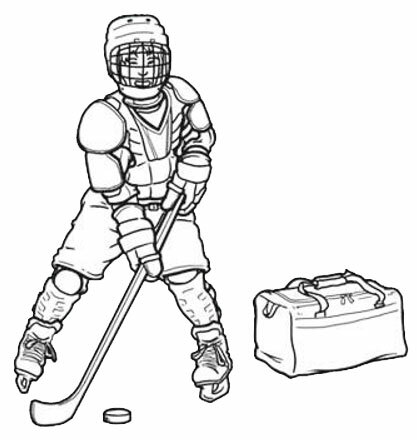 Selection of hockey equipment is a key issue for players, parents and coaches. When purchasing and fitting hockey equipment, remember two important factors: 1) make certain the player is adequately protected and 2) be sure the fitting allows freedom of movement so the player can properly perform the necessary skills. By carefully considering these two factors, your child will be more comfortable and will better enjoy their participation. Neck guard: Mid Coast Hockey requires all players in all divisions to wear protective neck guards. Mouth guard: Mid Coast Hockey requires all players in all divisions to wear protective neck guards. Skates must fit very snugly in order to provide support. Foot socks should not be a thick, heavy material, as such would inhibit the foots ability to directly control the skate. Skate blades must be kept sharp - even for beginning skaters. A professional sharpening is typically required after 5-10 hours of rink skating, more frequently if skating outside. Until a young player knows if they will play right or left handed, a flat blade is best. Once they find the side that feels natural to them, a minimally curved blade should be introduced. Hockey socks (held up by hockey shorts with a cup and velcro patches) to secure socks and optionally secured with tape around the shin pads will keep the shin pads from moving all around. Just a kind reminder before the start of the season, to please check your son/daughter's helmet. The expiration sticker is found on the inside/back of the helmet. They can potentially be checked by an official at any game and expired helmets will not be allowed on the ice. ©2019 Midcoast Youth Hockey - Jr. Polar Bears / SportsEngine. All Rights Reserved.